From The National in the UAE. An Irish couple have won a Dh1.7 million (US$462,850) refund on an apartment they bought in 2004 after a unit of Damac Properties failed to finish it on time. The case could become a precedent for buyers in buildings in the Dubai International Financial Centre (DIFC) free zone, which is regulated by a different set of laws than the rest of the emirate. The judgment stands out as a rare outcome amid thousands of protracted lawsuits and disputes that have arisen after the onset of a property recession in the region, especially in Dubai. Many cases have been filed, but are mired in lengthy proceedings. Noel and Lorna Gaffney won a “default judgment” on their case in the DIFC Courts after Damac Park Towers Company did not respond to their lawsuit, according to documents made available yesterday. Mark Beer, the registrar of the DIFC Courts, signed an order on March 31 requiring the refund of Dh1,781,009.01 to the couple within two weeks. Any delay to the payment would require the company to pay additional interest on the amount. 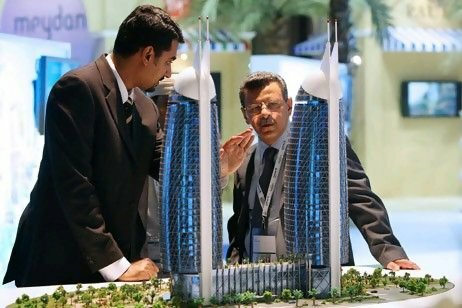 “The implication is that Damac will have to pay an investor back after delays, which will set a precedent for investors who have not received a property on time,” said Kaashif Basit, a partner at the law firm KBH Kaanuun who filed the case on behalf of the Gaffneys. Mr Basit said of Damac’s lack of response to the lawsuit: “Normally people don’t defend cases when they don’t have an answer.” Niall McLoughlin, a spokesman for Damac Properties, said: “Litigation is a component of all businesses in today’s corporate environment and it would be inappropriate for us to comment publicly on individual cases.” Damac Park Towers could counter the judgment, but would have to prove that it was not appropriately served with court documents or there was a strong reason why the judgment should be waived, according to DIFC laws. Mr and Mrs Gaffney bought apartment 602 in Tower B of Park Towers in December 2004, according to documents filed by the couple. The project is made up of two 49-storey buildings with curved glass facades. It is located about 10 minutes’ walking distance from the DIFC Gate Building. Construction is nearly complete and they are expected to be delivered this year, according to a recent press release from Damac. The Gaffneys said they were originally told delivery would be no later than “early 2008”. In 2006, the completion date was pushed back to June 2009, the couple said. The Gaffneys served a written notice last September on Damac Park Towers that it had breached the contract. They wrote again in October, notifying the company that the contract was terminated. They then filed a lawsuit in the DIFC Courts in January seeking a refund, as well as interest and other costs. Several individuals and groups of buyers have increasingly tried to use the DIFC Courts as an alternative jurisdiction to hear their cases because hearings are held in English and cases are perceived to move more quickly. I paid a total of 52,ooo pounds to Damac for 2No. apartments which were due to be completed in 2010 I witheld payment in 2010.
the apartments were comlpleted 2013. Damac said I had defaulted. I would have thought it was worth contacting KBH Kaanuun at the very least – +971 4 709 6700 or dubai@kbh.ae. .